Do awards and competition actually get volunteers to track hours? Part 1. Will software solve my problem? If you remember in our article, “Is your reason valid enough to track volunteer time,” we shared that volunteers need to know the reason why it’s important for them to track hours. However, sometimes, let’s admit it, our volunteers may be motivated to go out and volunteer their time in the community, however, when it comes to actually recording their time, they can tend to get lazy or just simply forget. Has it ever happened in your organization? If so, have you tried to run a competition or give out awards? I know what you’re thinking… “Those hokey things don’t work”. However, if that were truly the case, why do all successful volunteer organizations have them? 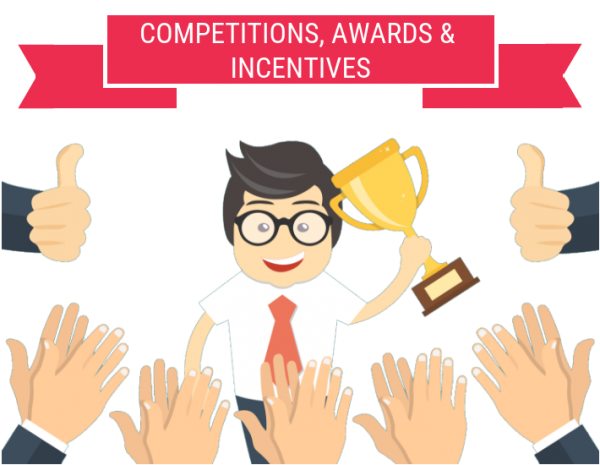 In this article, we’ll share about if and when competitions and awards work. Because everybody likes to be recognized! Everybody. So to help you create a stronger recognition system that actually gets your volunteers to track hours, download the worksheet on the bottom of this page before moving forward. Different reasons motivate us towards an accomplishment. Some are motivated by rewards and incentives, others are motivated through competition by seeing their name on a leaderboard. So when are good times to use competition and awards? Competitions won’t work if your volunteers aren’t motivated to win. However, if you know that your volunteer base likes a friendly competition, it’s one of the best ways to ensure that everyone participating will actually log their hours. It’s no fun to compete blindly. If your upper management wants to keep volunteer names private in a competition, then honestly, it won’t work. Competitions require a level of transparency so that volunteers can see where they stand on a leaderboard amongst their peers. Regardless of how you announce standings and leadership positions, competitions can’t work unless the volunteers are aware of where they stand. Use your social media platform, website, bulletins or any other form of communication you current use as your feedback report. The best competitors don’t compete just for the trophy. However, you can't develop a competition if you don’t have an award, at the minimum for the top achiever. Competitions don’t work if the volunteers don’t know at all times where they stand amongst other volunteers and how much they have left to catch up. Whether you have a live leaderboard or announce it on a regular basis, volunteers need a way to know where they stand. Competitors are motivated by more recognition. However, if you have a private competition where nobody knows who the winner is, then what’s the point? If you’re reading this, and you’re thinking… we really don’t want to encourage competitiveness, then don’t worry, competition isn’t the only incentive that gets volunteers to actually track hours. You can create a simple reward system, that can be just as effective. Similar to competitions, awards aren’t as appreciated when there’s nobody to share the joy with. Whether you do it through a public announcement or at a large gathering, volunteers strive for awards when they know they are showcased amongst their peers. Nobody wants to be left off that list! Sometimes, the real reward is not the physical item you’ve achieved, but the recognition that you get from a significantly important person in the organization or even above. Sending a city intern to a volunteer award ceremony will not be as impactful as sending the mayor. Half the joy of receiving an award is when your peers are cheering you on. But if nobody knows that I’ve received an award, what’s the joy in celebrating alone? There isn’t one. Volunteers want to feel acknowledged and appreciated. But if nobody knows, then how can they care. And if a significantly important person in your organization doesn’t know or care to know, then how can that make the volunteer feel? Actually no. If everyone can receive a reward, then what’s the point of trying harder? Volunteers can log and cannot log and if they are all treated the same, then most likely, your volunteers won’t be logging hours. With all this being said, as good as competitions, rewards and incentives can be, they should be your final touch in setting up a successful time tracking program. Getting your volunteers to actually track time, SHOULD NOT revolve around what pins and lapelles they can earn. After everything else is done, then you can add the icing on the cake - in this case, all the things we talked about in this article and in this one. As we’re wrapping up this series, some of you are probably thinking, “Hey! You all are smart cookies, but does this stuff actually work or are you just full of hot air! ?” Good point! Read the next article about how one of our customers followed these steps to get a tremendous amount of volunteers to actually track time.